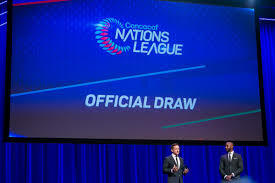 March 29 – The draw for the inaugural Concacaf Nations League has taken place in Las Vegas, US, preceding the governing bodies annual congress with all 41 member federations set to participate in an official regional tournament for the first time. It was a landmark moment for Concacaf which has reworked all its competition structures to provide more fixtures for its nations while trying to find formats that will be competitive and meaningful in a region that differs massively in scale from the commercial and football power of the US and Mexico, to the lesser resourced Caribbean islands. Competitive preparation for the draw had seen the nations play ranking matches – not just to provide a rationale for the Nations League group selections, but also to qualify 10 teams for this summer’s Gold Cup (the other six teams were pre-qualified from the 2018 World Cup qualifiers). These 16 teams comprised League A of the Nations League and intriguingly mixes relatively unknown minnows like Bermuda with Panama and Mexico, Martinique with Honduras and Trinidad and Tobago, and Curacao with Costa Rica and Haiti. Concacaf president Victor Montagliani said the Nations League was a symbol of the unity and progress the Confederation has made since the dark days of the US Department of Justice arrests in 2015, and that the fact that every nation in the region was involved in a single competition for the first time in their history was a significant mark of their unity. This wasn’t just public relations spin from Montagliani. Concacaf’s member associations, many of whom were initially sceptical of the proposals, were now universally welcoming of the opportunities to play provided by the new competition. The home-and-away group stage of the 2019 Concacaf Nations league will be played September, October and November 2019 with the Final Championship will take place in 2020.